Last month, 16 students, faculty and staff from Loyola University New Orleans traveled to Belize, Central America for 24 days to host the ‘Umadagu Lescuelana’ summer camp in the coastal town of Dangriga, Belize. This year was the 20th anniversary of the camp, which was first started in 1991 by the Rev. Ted Dziak, S.J., vice president for Mission and Ministry at Loyola. Loyola students teamed up with local Belizean co-teachers for the fifth year in a row to run a two-week day camp for more than 250 local primary school students. 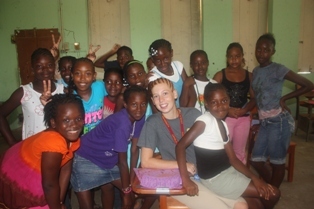 Each pair of American-Belizean teachers had their own class of 20-25 students, teaching math, English, and arts and crafts. In the afternoons, the teachers organized basketball, soccer and volleyball games with the children. At the end of the camp, they held an “Olympic-style” field day with student competitions and a parents’ night featuring skits, songs and dances. The Loyola volunteers experienced an amazing cultural immersion as they traveled the country before and after the camp, visiting Mayan ruins, waterfalls in the rainforest and a beautiful coral reef off the coast. They visited their co-teachers’ homes and spent time meeting family and friends. 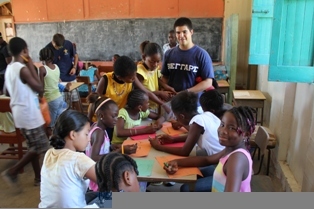 The volunteers spent the spring semester preparing for the trip. They learned about the Belizean culture and the people they would serve, raised money through fundraising, and participated in local community service projects to build their local community. The two goals of the program, which have remained the same for 20 years, are to serve and to learn, said Dziak. The Ignacio Volunteer Belize 2011 community consisted of: Daniel Afanador, Cristina Calderon, Christopher Kelliher, John Magallanez, Carissa Marston, Gracie Palombo, James Rose, Janece Bell, Kathleen Murphy, Jeff Ramon, Kurt Bindewald, Ken Weber, Frank Flaspohler, Peter Stewart, LeJeune, and Dziak.